Aster Pharmacy centers around a client driven methodology, helping us protect an enthusiasm to serve and empathy to mind. They have confidence in remunerating their clients and esteem steadfastness by giving administrations like ATM (Any Time Medicine) notwithstanding offers, plans and advancements refreshed by messages and telephones, guaranteeing 'considerably more than medicines. Notwithstanding giving simple accessibility of drugs and items, Aster Pharmacies have qualified staff who can direct costumers with eating routine, sustenance and therapeutic gear. Their item run incorporates therapeudic, nutritive, and infant items, way of life, wellbeing and restoration items, FMCG items, beauty care products, individual and home consideration items. Beginning the adventure with only one drug store in 1987, Aster Pharmacy, a division of Aster DM Healthcare has developed throughout the years and built up itself as a dependable medicinal services supplier. Perceived today as the locale's driving drug store retail chain, Aster Pharmacy began with an attention on "conveying great wellbeing and satisfaction" through benevolent neighborhood drug stores which were client driven and effortlessly available. Throughout the Years, the system has extended jumps and limits, coming to up to a quality of in excess of 200 drug stores with a mission to convey itself closer to its customers and have an Aster drug store in each area and a proficient Aster drug specialist accessible all day, every day for each house hold. Aster Pharmacy has gotten a few honors and acknowledgments including a fourth time win of Best Pharmacy Award (2010, 2011, 2014 and 2015) by Dubai Service Excellence Scheme. In the GCC states, Medcare Hospital and Aster drug store gotten quality and administration grants, separately, from the Dubai Department of Economic Development in 2014. In 2015, Aster Pharmacy got the Mohammed Bin Rashid Al Maktoum Business Award and given the 'Superbrand' status by the UAE Superbrands Council. Its example of overcoming adversity started with a humble starting route in 1989 with the opening of the primary drug store, and there has been no turning back from that point onward. As the years passed by, more outlets were added to its family and the system developed to its current size. They initiated their 100th drug store in April 2014 at the Dubai Healthcare City (DHCC) and go for opening more than 300 outlets by 2017, in this manner having situated ourselves as the biggest retail drug store chain in the UAE. Aster Pharmacy is dynamic in the UAE as well as in Kuwait, Qatar, Oman and Jordan. 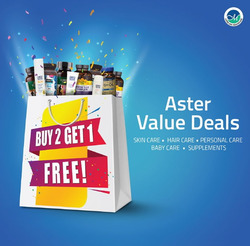 Do you want to receive more offers from Aster Pharmacy by email?